Everyone must have seen the pictures of cockatoos and parrots with a featherless chest. Sometimes even the whole bird is featherless, exposing a dark grey skin. The lack of feathers can have two causes; a disease or the cockatoo plucks his own feathers. For more information about the diseases, check the Psittacine Beak and Feather Disease page and the Giardia page. This page is about cockatoos pulling out their own feathers. You have a cockatoo and one day he starts pulling out its own feathers. Usually he starts with a few feathers on his chest. You begin to notice a bald spot, it’s even getting larger and every newly growing feather gets pulled out as well. He will pull out more and more feathers, littering the floor with his beautiful feathers until he is bald except for his head. Some cockatoos will even bite or nibble at their own skin, causing a wound on their chest. Other cockatoos never pull all their feathers, for example they pluck just their feathers on their chest. Most cockatoos start plucking themselves out of frustration and boredom. Cockatoos are smart birds that are build to live freely with other cockatoos in stimulus-rich nature. Now it finds itself in a cage with few or no toys, only few interaction with other beings, no mates, no other cockatoos, no distractions from its life in the cage. Out of frustration the cockatoo will start pulling out his own feathers. Not every cockatoo in such a situation will start plucking, but many start this behavior in this situation. Even when the cockatoo is removed from his dull and frustrating environment, he can continue to pull his feathers out of habit. When feathers get pulled out multiple times, damage is done to the follicles in which they grow. After a while the feathers will never develop again. Sometimes there is a medical cause to plucking, like itching parasites, Psittacine Beak and Feather Disease, itchy skin or a lack of certain nutrients. Always talk to a vet when your cockatoo starts to pull his own feathers. When a cockatoo develops the habit of plucking, it can be challenging to make him stop. You have to both remove the causes of plucking in the first place, and provide the cockatoo with enough distractions to not continue his habit of plucking. 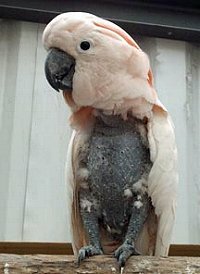 Sometimes the vet can fit a plastic collar or plastic chest protector on the cockatoo to physically prevent the cockatoo from reaching his feathers or skin. This is not a permanent solution, but can help to have the feathers regrow and the wounds heal. The best remedy is placing the cockatoo in a large aviary with other cockatoos of his species. He will have a lot of interaction with his conspecifics and he will not be bored. When a cockatoo continues to pull his feathers, they eventually will not grow back. This spot on the body will stay bald for the rest of its life. If it also develops a habit of inflicting wounds on its body, it will eventually die of infection. It is crucial to keep cockatoos in an environment that will keep him happy and healthy.